It's In Your Hands. Degree Show Piece, 2013. Created to subtly involve the examiner in the creation in my degree show through the reading of my compulsory Contextual Document. A site specific archive of my work. 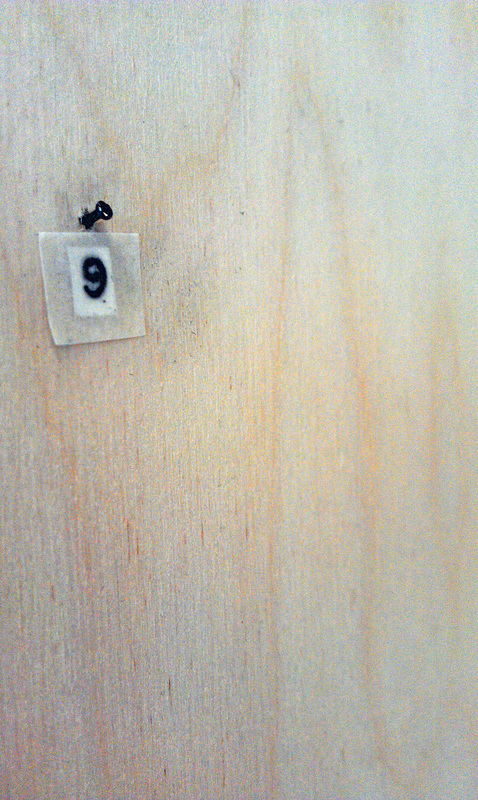 The viewer, in this case the examiner, enters the space to find blank walls, a box numbered '6' on a far table and a bag that says 'Open Me' on the closest table. On the table next to the bag are masking tape 'templates'. It will soon be obvious that these match the size of the boxes within the paper bag. On opening the bag they first come to a blank, handmade, cardboard box. ...As you read the document you will be directed to open the relevant boxes. Continue as directed by the document." As the viewer reads through the book they come across tabs which highlight the title of an artwork and give a number. The indent of the number in the book is attached to a box. Box numbers 1 through 5 are encased within the brown paper bag. Box number 6 is larger and on the far table within the space. Box 6, containing my most recent and largest project Under The Stairs contains the instructions "Hook Tab To Hook Number One To View"
Small hooks, numbered 1 through 25, can be found on the wall to the right side of the table. Once all the images from Box 6, Under The Stairs, have been hung to the wall the examiner will have successfully hung this installation piece ready for the degree show. This will hopefully look like the image to the left - though I have no control over this. indicating the intention that s/he has become part of the work through participating in the hanging of it whilst reading the compulsory Contextual Document. What the public sees on the 7th June relies on how the examiner chose to leave the space. I have no control over this. Viewers will be welcome to pack and unpack the work again, however it is only the examiner that will have the full experience of the work. 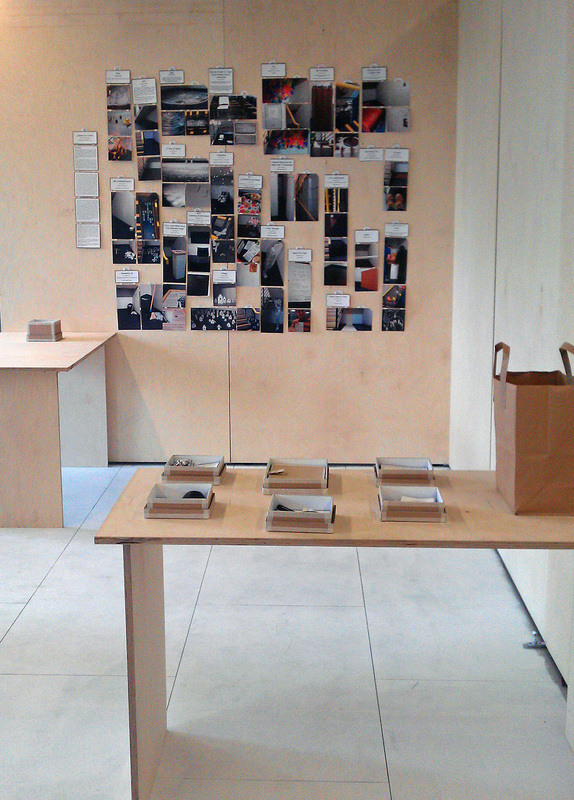 On completion of the degree show every box will be packed back in to the paper bag to form an archive. 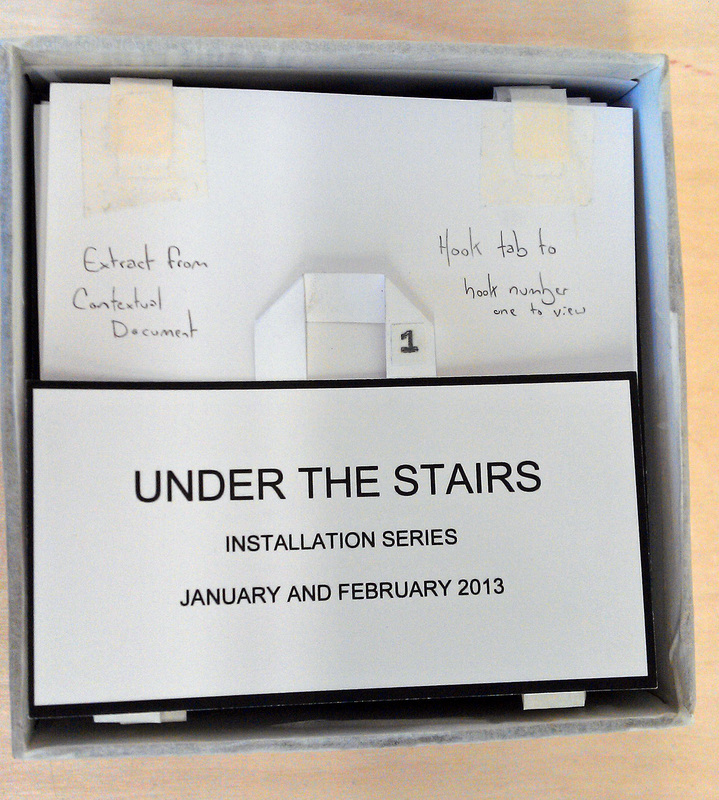 Each box can stand alone to describe their project singularly and away from the archival document or work with the document to become an archive experience. 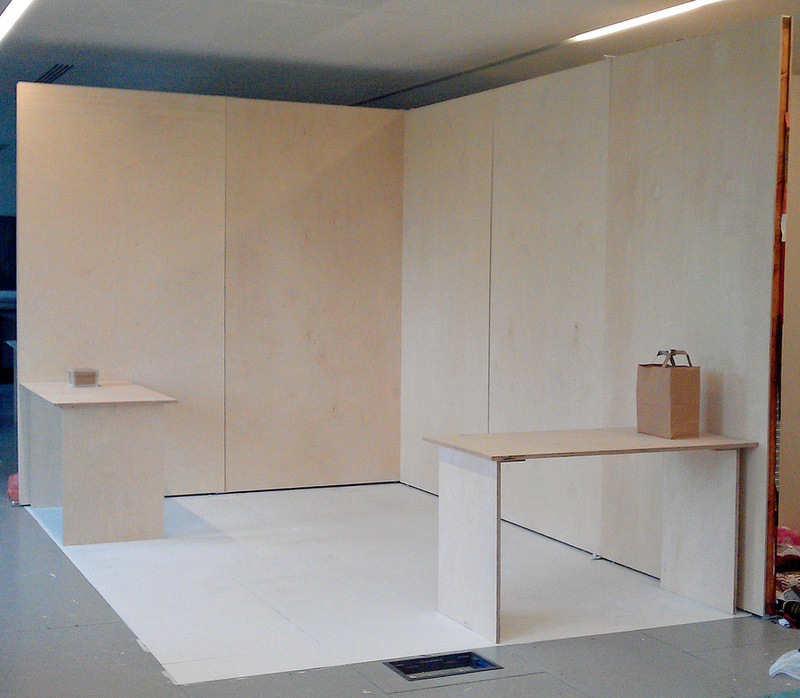 However, Box 6 will later be adapted to take away the interactive, hanging aspect.